Yorkshire County Cricket Club is by far the most successful countycricket club in history. Since the County Championship was constitutedin 1890, Yorkshire has, in addition to one shared Championship, won itoutright on 30 occasions and Yorkshire cricket supporters take greatpride in the county's cricketing history. As well as the club'ssuccesses, there have been 42 Yorkshire players chosen as WisdenCricketers of the Year. Many have been world-class cricketers such asWilfred Rhodes, Len Hutton, Fred Trueman and Geoffrey Boycott, withdistinguished England careers. Many thousands of Wisden pages have been filled with Yorkshirecricket, Yorkshire cricketers and Tests in Yorkshire. 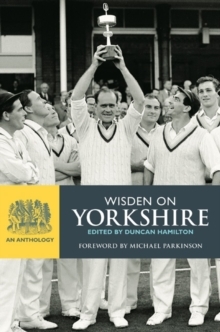 Wisden onYorkshire is a fascinating journey mixing great matches, personalities,feats, controversies and unusual occurrences.